The Justice Coin from the Historical Coin Mint commemorates May 1, 2011, the day Navy Seal Team 6 carried out Operation Geronimo and took down Osama Bin Laden. Thanks to these heroic men, justice has finally been brought to the victims of September 11 and their family members after almost 10 long years. The Justice Coin is a rare commemorative tribute to the brave soldiers of Seal Team 6 that carried out their mission successfully and will be forever remembered as heroes. It comes in both a gold and silver edition. The Gold Justice Coin is richly layered in 24 karat gold while the Silver Justice Coin is richly layered in pure silver. 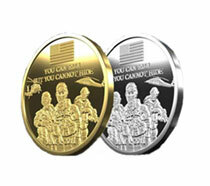 The front of the coin features the words “You can run but you can’t hide” under the American flag along with the image of three Navy Seals and 2 Navy choppers. The reverse of the coin has the quote “Whether we bring our enemies to justice or bring justice to our enemies, justice will be done” form President George W Bush and “Justice has been done” from President Obama. You can purchase both the Gold Justice Coin and Silver Justice Coin for $19.95 plus shipping and handling. You’ll also receive 2 Acrylic Capsules for the coins, 2 Certificates of Authenticity, and a copy of the US Navy Seal Creed. As a special bonus you can also get a Military Briefing Packet and a Gold Lapel Pin for free with your order. You just have to pay an additional shipping and handling charge for them.